In our debut episode of the RPM podcast, we shine a light on Indigenous musicians from the Coast and Straight Salish territories where RPM is based. Broadcasting from our office in Vancouver’s Chinatown district, we explore what Indigenous music culture means to artists with a direct connection to their people, land, culture, and musical identity. Host Ostwelve speaks with emerging Stó:lō R&B singer Inez, Sḵwxwú7mesh hip-hop artist Discreet Da Chosen 1, Haida singer-songwriter Kristi Lane Sinclair, and the multi-talented Kwakwaka’wakw, Cree, Nisga’a, and Coast Salish radio host/promoter/artist manager Suzette Amaya. Plus, we get some special inspiration and Indigenous reflections from the one and only Clarence Two Toes. The RPM podcast is produced & engineered by the amazing and multi-talented Paolo Pietropaolo. We couldn’t possibly showcase the full diversity of the West Coast Indigenous music scene in a single podcast, but check out our YouTube Playlist: West Coast – Volume 1 for video selections from other coastal artists. 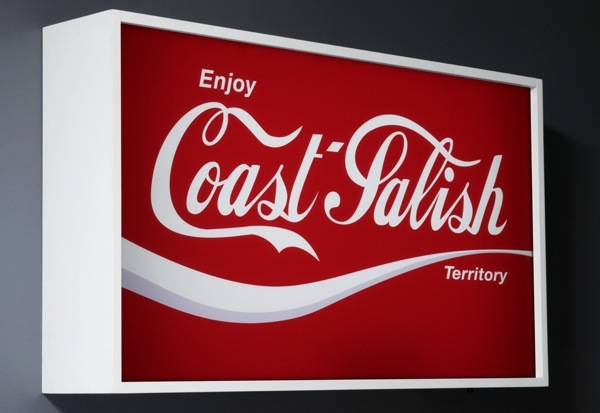 Photo Credit: Big ups to Laich-kwil-tach (Kwakwaka’wakw) artist Sonny Assu for his amazing “Coke Salish” piece. Hey cool! Thanks for including my work! Miigwech for the amazing art, Sonny! We’re big fans.